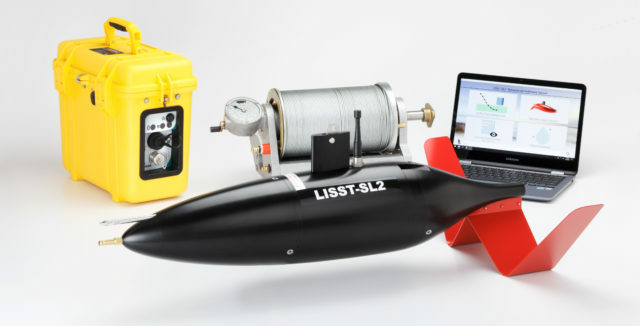 The LISST-SL2 is an advanced version of the original LISST-SL instrument for sediment transport studies. It is not a sampler. It draws water in and blows it out. No water sample is retained. Laser optics and electronics are contained within the streamlined body. Power and communication is via the 2-conductor B-reel cable. The instrument has its own depth sensor, therefore it does not depend on wire angle to estimate depth. Engineering data to confirm iso-kinetic use. River velocity is sensed with a pitot tube. An internal computer-controlled pump adjusts to draw water into the instrument at matching velocity. This ensures iso-kinetic measurements in rivers or streams. Iso-kinetic measurement is important so as not to bias particle size distribution. [Iso-kinetic is when water enters the instrument intake nozzle at a velocity equal to river free stream velocity]. The streamlined LISST-SL instrument is lowered into water on a wire, a B-reel is standard. It is battery-operated. The battery, instrument data collection, and storage electronics are housed in the Topside Box. This box is used by the operator from a bridge on the river, or on a boat. Battery capacity is sufficient for several hours of operation. Data is stored for subsequent download and processing. Data processing software is provided. 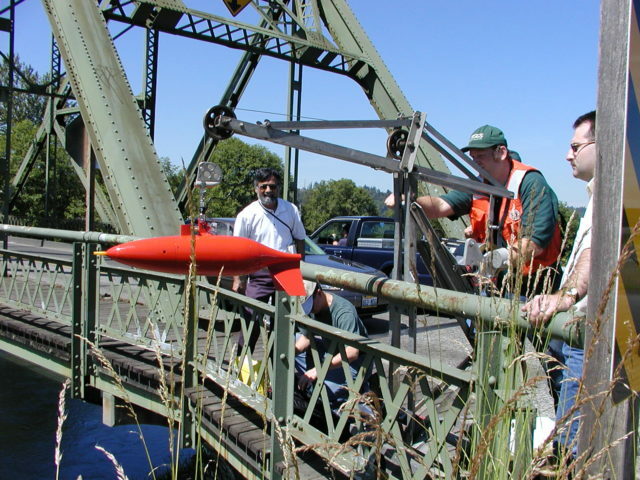 LISST-SL instrument being lowered from a bridge by USGS and Sequoia personnel (left). On right, the LISST-SL is shown swimming just below water surface, as it transmits data up the suspension cable. [ The LISST-SL is highly streamlined, so it follows the instantaneous current direction which varies with turbulent eddies that reach the surface.]. The crane used for this purpose is standard USGS equipment to lower samplers. Example data can be seen in a separate article.